It's that heart-stopping moment when your phone tumbles from your hand and hits the floor, before refusing to switch on. Or when it falls into a puddle, its screen never to glow again. No one should have to suffer such traumas. If you've developed a nasty (and expensive) knack for dropping your phone, having it shielded by a material capable of stopping a speeding bullet would come in handy. Researchers at MIT and Rice University in the US have developed polymer coatings which have a 'layer-cake' structure - rubbery layers providing resilience and glassy layers providing strength. So tough are these polymers they're being tested by firing glass beads at them using laser pulses. Though this super-thin material is being touted as the next big thing shielding military vehicles and satellites, there's no reason it can't end up protecting your mobile as long as a thin enough version can be developed. British firm, P2i has created what's being described as liquid repellant nano-coating technology. When water's spilled on a phone, the adhesive attraction between the water molecules and the phone are stronger than the cohesive forces within the liquid, so water spreads out on the mobile's surfaces, ruining it. But with the nanocoating, the phone's surface energy is reduced. It means the attraction between the water molecules themselves is stronger than between the water and the phone's surface, so the liquid simply forms beads and rolls away. 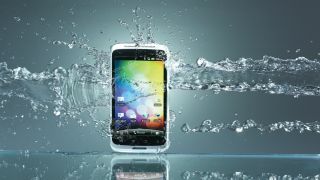 A splash-proof version of the tech is already found on the likes of the Motorola Moto X and Moto G as well as the Alcatel One Touch. But P2i has also developed 'Dunkable' tech that would protect a phone even when it's submerged. It says its been proven in the labs and is working towards large-scale production. What if when you dropped your phone, an airbag shot out from the back of it mid-descent, softening the blow as it touched down on the pavemen? Well, that's what Amazon founder Jeff Bezos hopes will happen. He's patented a system which uses a phone's internal gyroscope, camera and accelerometers to determine it's gone into freefall, promptly releasing the airbag when it has. Whether an airbag can be packed into a mobile so it's not too bulky remains to be seen. Our phones will increasingly have coatings on their surfaces to protect them from the worst we can throw at them. But what if these coatings are themselves scratched or gouged away, losing their protective abilities? Prof Bert de With at Eindhoven University of Technology in the Netherlands has found a way to attach 'hydrophobic', water repelling, molecules to the end of polymer 'stalks'. This means that any water-repelling molecules removed by scratches are replaced by a new, self-orientating layer. If you're a member of the military special forces and are likely to take your phone with you on an operation, or you're just an incredible clutz, you could do a lot worse than have it made out of carbyne - a material stronger than both graphene and diamond. It's made up of a chain of carbon atoms held together by double or alternating single and triple chemical bonds. In tests carried out at Rice University in Houston, it was shown to have a tensile strength greater than any other material. The trouble is, you might have to wait a little while for a carbyne-coated phone - so far, only small amounts have been made in the lab.